Want to learn sign language but don’t know where to start? Estrella Mountain Community College (EMCC) has you covered. 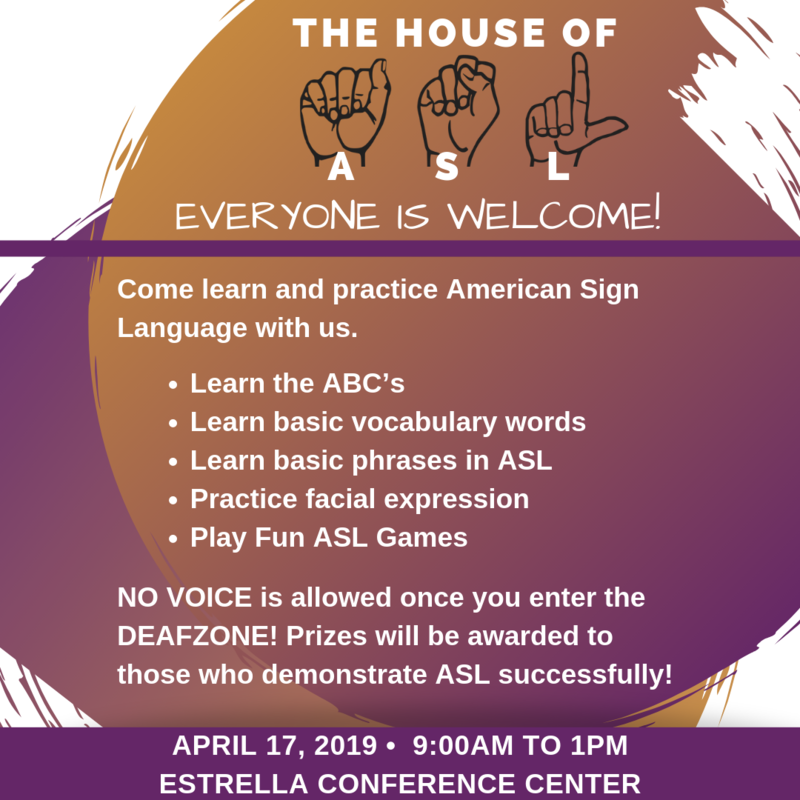 The college is hosting The House of ASL from 9 a.m. to 1 p.m. April 17 at the Estrella Conference Center. This is the fourth time the college has held the event, which takes place every other year in the spring. Previously called “Deaf Deaf World,” The House of ASL will teach American Sign Language ABCs, basic vocabulary words, and basic phrases, just to name a few. Participants will also practice facial expressions and play fun ASL games. It generally takes someone about two years to become fluent in ASL, Yalim said. However, The House of ASL students should be able to introduce themselves in ASL, sign some words, and sign simple sentences after completing the course, Yalim said. It’s also a great refresher course for people who learned ASL in the past. While actually learning ASL is essential, The House of ASL participants will also learn about deaf culture. Yalim, who is deaf, has been an ASL instructor for more than 19 years. He said he was inspired to teach ASL because most of his family members can hear but only some of them can communicate with him in ASL. It is unknown how many Americans use ASL as the Census Bureau does not track this data, but estimates put it at 250,000 to 500,000. Change.org claims it’s one of the fastest growing languages in America and is the fourth most used and third most taught language in the U.S. EMCC has three deaf instructors and a few deaf students, and this semester alone the college is offering nine ASL classes with 155 students. It’s become so popular that another class will be added next semester. According to the National Institute on Deafness and Other Communication Disorders (NIDCD), about 2 percent of adults ages 45 to 54 have disabling hearing loss. That rate increases to 8.5 percent for adults ages 55 to 64, 25 percent for ages 65 to 74, and 50 percent for 75-year-olds and older. Although age is the strongest predictor of hearing loss, two to three out of every 1,000 children in the U.S. are born with a detectable level of hearing loss in one or both ears, and 13 percent of Americans 12 and older has hearing loss in both ears, based on standard hearing examinations. Yalim said even those who don’t need to sign on a regular basis to communicate should learn ASL. “They will feel like they’re in The Twilight Zone,” Yalim said.